Adapting a stage script for the screen is not straightforward. For one thing, learning how to navigate the differences in pace between a live theatre performance and the screen screen requires tremendous skill. Every once in a while, however, a stage script is strong enough that it can be lifted almost verbatim and will still work as a splendid film. This weekâ€™s movie recommendation, Nicholas Hytnerâ€™s adaptation of Alan Bennettâ€™s The History Boys (2006), is one such film. The film is set in 1980s Yorkshire, in a small town outside of Bradford. Eight high school-age boys have done exceedingly well on their final examinations, and show some promise for university spots at Oxbridge. They are impossibly erudite, and uncontrollably hormonal. 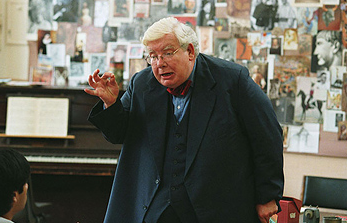 Thanks to their charming but unconventional teacher Hector (played by Richard Griffiths) they can recite the poetry of Hardy as fluently as they can procure the services of a French prostitute. While their minds are brilliant, they are also puerile. What they lack, according to the officious schoolmaster, is panache. In order to compete with the aristos against whom theyâ€™ll be pitted in the dreaded Oxbridge interviews, they must learn to rein in their bawdy schoolboy attitude. The schoolmaster therefore hires a temporary history teacher, Irwin (played by Stephen Campbell Moore), to whip the boys into shape. The rest of the film deals with the boysâ€™ (and teachersâ€™) struggles with their friendships, their beliefs, and their sexualities. Those challenges play out in the context of two fundamentally different approaches to schooling: on one hand, the instrumentally-minded Irwin is focused on the â€˜gameâ€™ of getting the boys accepted to Oxbridge; Hector, on the other hand, cares little for the boysâ€™ destinations, and urges them to focus instead on the journey of learning. Those familiar with Hytnerâ€™s earlier adaptations of stage scripts will notice a common theme: like his versions of Millerâ€™s The Crucible (1996), and another Bennett play, The Madness of King George (1994), this isnâ€™t a film one watches for the use of camera, lighting, or soundtrack. Sometimes one even gets the sense that the talented acting is being used merely as a vehicle to maximise the wit of the script. Nonetheless, sterling performances shine through on all counts. Iâ€™ll highlight Richard Griffiths in particular, only because Hytner successfully brings out in his portrayal of Hector that same quality that you notice in Nigel Hawthorneâ€™s King George â€“ despite all his flaws, he is instantaneously and unavoidably likeable. The film never succeeded quite as well as the stage version. But, given that the play was one of the most well-received stage productions in the last 50 years, that isnâ€™t saying all that much.